Afg vs Ban Asia Cup 2018 is the 4th match of Super Four of Asia Cup 2018. You can get live cricket score and full highlight. This match is being played in Sheikh Zayed International Cricket Stadium Abu Dhabi on 23 Sep 2018. 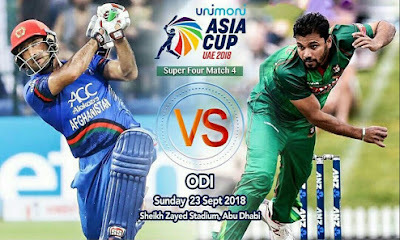 Hi friends, I am Gyan Ranjan In this blog post I am about to give preview, prediction and live cricket score of this high voltage Afg vs Ban 4th match of Super Four of Asia Cup 2018. Bangladesh lost his important top order batsmen's wickets in earlier overs and rest batsmen struggling with Pakistan's bowlers to build a big total. Imrul Kayes 72, Mahmudullah 74, Liton Das 41 and M Rahman played an inning of 33 runs. Bangladesh scored 249/7 in 50 overs. Aftab Alam got a maximum of 3 wickets for Afghanistan. Mujeeb Ur Rahman and Rashid Khan got the 1-1 wicket. Two batsmen lost their wickets as a result of running out. H Shahidi played a great inning of 71 runs. M Shahzad 53, A Afghan 39, M Nabi 38 and S Senwari played an inning of 28 but performance of these batsmen was not enough to get winning target. Afghanistan could score 246/7 in 50 overs. So Bangladesh won this very interesting match by 3 runs. M Murtza and M Rahman got the 2-2 wickets while Sakib Up Hasan and Mahmudullah got the 1-1 wicket for Bangladesh in this 4th match of Super Four of Asia Cup 2018 Afg vs Ban.